Nobody wants to look at a cluttered Pinterest board on your profile. Nobody. It might look fun to you on your bedroom wall, but it looks much more like that classifieds poster board at the Student Union or the local 7-Eleven: all weathered, wrinkly, and likely coffee stained. Think of your Pinterest boards as what Pinterest was built as and meant to emulate—bulletin corkboards. Keep focused on your theme. We all like diversity. But there can be too much. If a board starts getting scattered, you will lose credibility. Time to make a new board with a more specific theme and move some over. The benefit is that the more specific your board is, the more likely you will catch more followers. When you first start out pinning, this one doesn’t really matter much. But when you care about growing and keeping your followers, ease up on the clicking. Try to space out your pinning. Pin 4 or 5 pins in a couple of hours, and then just chill out for a few more hours and go back at it. The problem with Pinterest is that it fills up the home page with everything you have pinned and the follower has to go all the way to the bottom of the list to get to anybody else. Normal people see this, get slightly annoyed, and then one by one, your followers drop. So chill. 3. Don’t Be an Overtly Obvious Marketer! If you have ever read even one thing that we have written about Pinterest, you know that Pinterest is one of the greatest internet marketing tools and can be an awesome source of potential customers and free advertising. Although everybody knows that, you don’t need to treat it that way. There is no reason to be a selfish pinner and just pin your own products. You could. But you shouldn’t. Get people attracted to you through your appreciation of the product and of its category. Pin relevant things, interesting topics in your field, and nice images. You can stretch the personality of your brand into all sorts of areas of visual interest. If you sell handmade Obama bobble head dolls, don’t just pin Obama bobble head dolls! Broaden it out and pin Obama-themed political cartoons or other novelty figurines. 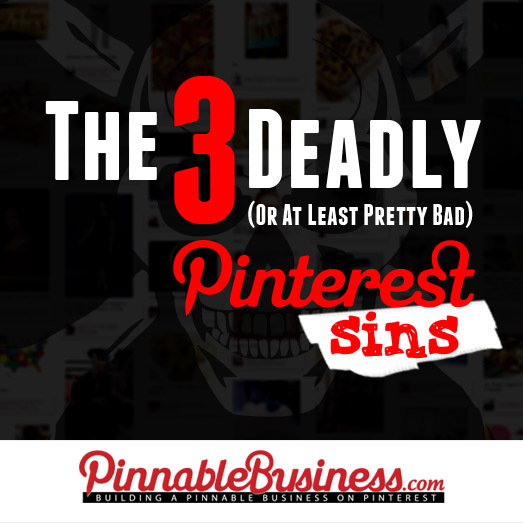 I hope that now you are somewhat more aware of the impact of your presence on Pinterest. Avoiding these pin sins will likely bring you an increase in followers. If you have already committed one or all of these, there is hope for your Pinterest soul yet. Start fresh and get pinning! Here is some more reading about Pin Sins and Wins.